What are personalized search results and what happens when the setting is turned on? If personalised search results are turned on that means that we pass a unique identifier to our partner Bing. Bing will then adept and improve your search results based on your previous search history. The differences are generally quite subtle, but the more confidence we have about what your intent is, the more personalized the results will become. We certainly don’t want to make any assumptions that prevent you from seeing a diverse set of results and lock you into a “filter bubble”, so the results that correspond to differing intents will still be available to you on the page. Why would I want personalized search results? Ambiguity is a big challenge for search engines. You generally search with a clear intent in mind, but without context, the phrase you enter may have a very different meaning to someone else. As an example, let’s say you entered the search term "Australia". You could be in the process of planning a vacation. In this case, you’re most likely to be looking for websites specifically about the country Australia, or information about travel. Or suppose, instead, you’re a movie-buff and are trying to decide on a movie to rent for the evening. In this case you are looking for details regarding the movie Australia. Without any context it is very hard for a search engine to serve your the most relevant results for your specific intent. How do I turn personalised search results off? If you would prefer your search results not to be customized based on your past search activity, you can turn off personalised search results at any time in your settings. If you turn this setting off, we will not pass any unique identifier to Bing. Please bear in mind that we still pass your IP address and other data to Bing in order to provide the search service. 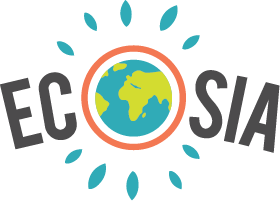 How do I set Ecosia as my homepage in my browser? When searching how to turn off my search history, I discovered that your service is partnered with bing. Although I support your mission, I also boycott bing and therefore will be uninstalling your service. I wish you the best, and would be happy to support you in the future if you find a better partner.